On the morning of March 9, 1984, five men left Sausalito aboard Francis Dowd’s 34-foot Chris Craft Aloha for a day of salmon fishing at Duxbury Reef, a popular spot off the coast of Marin County. Aboard the Aloha were Dowd (a senior executive at Raytheon), his 19-year-old son, his brother-in-law, a fellow Raytheon executive, and a business associate. Somewhere west of the Golden Gate Bridge, the Aloha vanished with all aboard. Dowd’s body was recovered in San Francisco Bay a month later, but the Aloha and the others aboard were never found. A lawsuit citing Dowd’s negligence was filed by the widow of one of the lost fishermen, and Jacobs, a young maritime attorney and former merchant seaman, was hired as defense counsel. Believing that Dowd, an experienced boater who had served as petty officer first class in the U.S. Navy’s submarine service, could not have been negligent, Jacobs needed to convince a jury that the Aloha was doomed by circumstances beyond her captain’s control. Jacobs believes the Aloha was sunk by a ‘coincident wave.’ These dangerous but largely unknown anomalies differ from deep ocean rogue waves. Coincident waves occur near to shore, on the lee side of islets and submerged bars, typical to all coastlines. The story centers on the passion-driven courtroom battle, pitting widow against widow. As there were no survivors or eyewitnesses to whatever happened, the jury trial hinged on the testimony of both sides’ expert witnesses who intertwined the physics of wave formation, navigation, and meteorology with the all-too-human story of the fragility of life. A member of the California bar for more than 35 years, Jay Jacobs lives on an island in the Pacific Northwest with his wife Marsha. 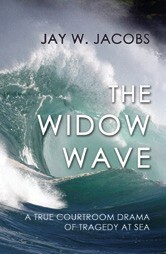 The Widow Wave is also available in hardcover or e-book formats. To learn more, visit thewidowwave.com.